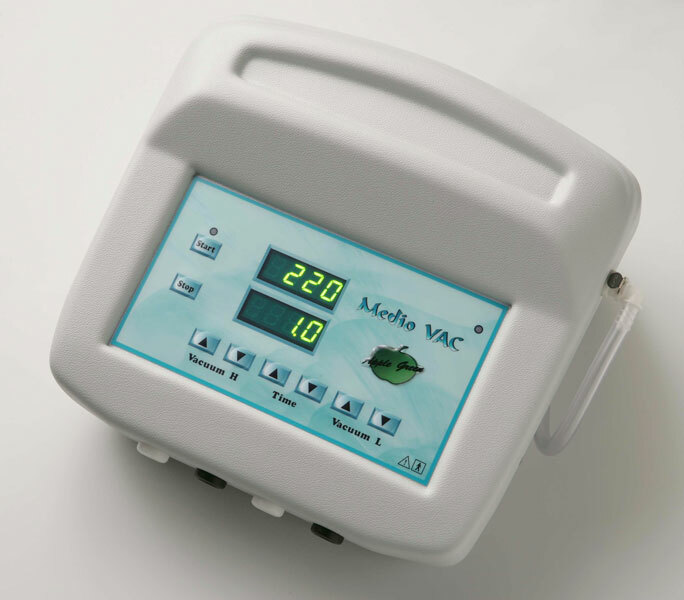 The Medio VAC are computer controlled devices used for attaching the electrodes to the patient’s body with suction. This technique replaces a time consuming attachment of electrodes with elastic/ rubber straps or expensive self-adhesive electrodes, and therefore makes the work in health centers, hospitals, and spas faster, easier, and cost effective. Despite being powerful, the devices remain small and portable so the user can move them around and even use them in the field. The devices offer the user three different modes of operation: constant vacuum, low frequency intermittent vacuum, high frequency intermittent vacuum. Because of the adjustable power of the suction devices enable a range of possible treatments suited to each patient. Intermittent vacuum suction accelerates blood circulation and the exchange of nutrients between blood and tissues. Interfacing the devices with the chosen companion device is simple by using the sockets on the rear side of the devices and appropriate cables.